In some respects, change in downtown Phoenix seems glacial. In other respects, it’s happening at light speed. About fifty percent of the building mass in this photograph is new since 2001, the benchmark year when eye lounge first opened it’s doors. 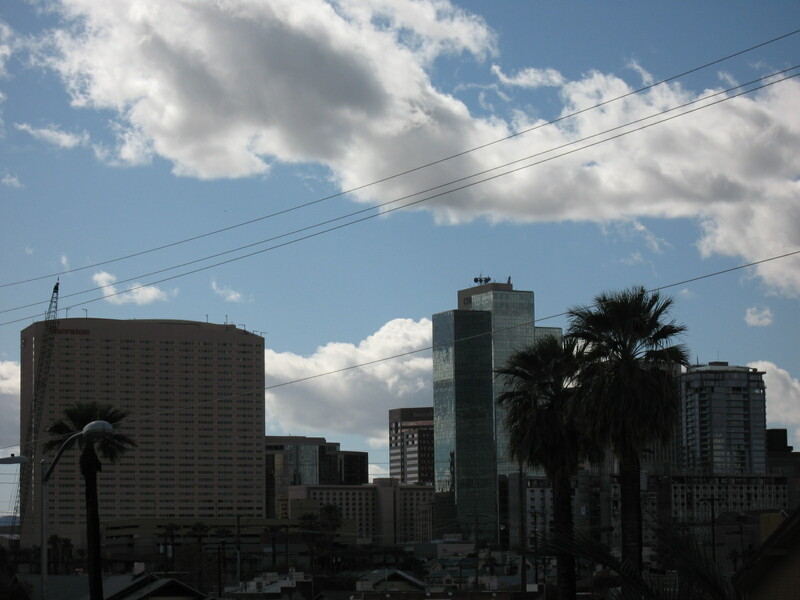 The arts have been a key catalyst for revitalization in downtown Phoenix. There is also a tremendous synergy from multiple independent efforts to adaptively re-use the 100-year-old building stock in the neighborhoods of downtown Phoenix as gallery, studio and performance spaces. The collective efforts seemed to reach a critical mass around 2003, around the time the City of Phoenix began efforts to place a major sports venue on top of an emerging, grassroots arts district for the third time. I’ve been in the trenches in this urban evolution for over a decade. My hat is off to others who have been here even longer than that (Dana Johnson, Kim Moody, Beatrice Moore, Tony Zahn, Helen Hestenes, David Therrien and others). Many others have come and gone over the years. There are multiple words for this struggle (and it is a struggle) we undertake everyday to maintain vitality and foster opportunities for cultural expression: revitalization, redevelopment, development, gentrification. The words chosen to describe this activity and change often betray the sentiments of the person using them. Revitalization has a far more positive connotation than gentrification. Gentrification tends to imply wealthy developers, investors and young urban professionals displacing working class families. Many of the artists living and working in downtown are low to moderate income. The myth of the starving artist is not always a myth. In 2001, people were afraid to get out of their cars in this neighborhood after dark. When 20 people attended the first eye lounge opening on First Friday, January 4, 2002, we thought it was an overwhelming success. When 515 Arts was established later in 2002, it took many months before people would walk the unlit distance of one block from eye lounge and Modified Arts during evening opening receptions. There were active and on-going open air drug sales and prostitution (male transvestites, primarily). Assault and muggings were not uncommon. A serial murderer was active in the Garfield neighborhood and arson occurred regularly. There was more than a fifty percent drop in reported crime along the Roosevelt Row corridor from 2002 to 2005 while crime increased overall 14 percent citywide in Phoenix. The actual reduction in crime was more significant due to the large number of unreported crimes. The city also benefited from increased property tax (both due to property values increasing, and an increase in number of occupied properties), increased sales and privilege tax, and new development that was attracted to the area including the Artisan Village project at 7th Street and East Roosevelt. According to a survey conducted by the Phoenix Office of Arts and Culture and Americans for the Arts in October 2006, the audience of roughly 20,000 people that attend the free monthly First Friday artwalk are educated and have disposable income. 67% of attendees have 4 or more years of college education and 23% have annual household incomes of $100,000 or more. The Evans Churchill Community Association supports high-density mixed-use infill development while the Garfield and Roosevelt neighborhoods seek to preserve the historic single-family homes that characterize their communities. While developing a plan for the Evans Churchill area, city staff recommended naming the neighborhood “North of Copper Square”. I suggested the acronym for that name would end up being NoCops. That helped persuade the city to accept the neighborhood’s preference to use the name based on the area’s two original historic subdivisions: Evans Addition and Churchill Addition.